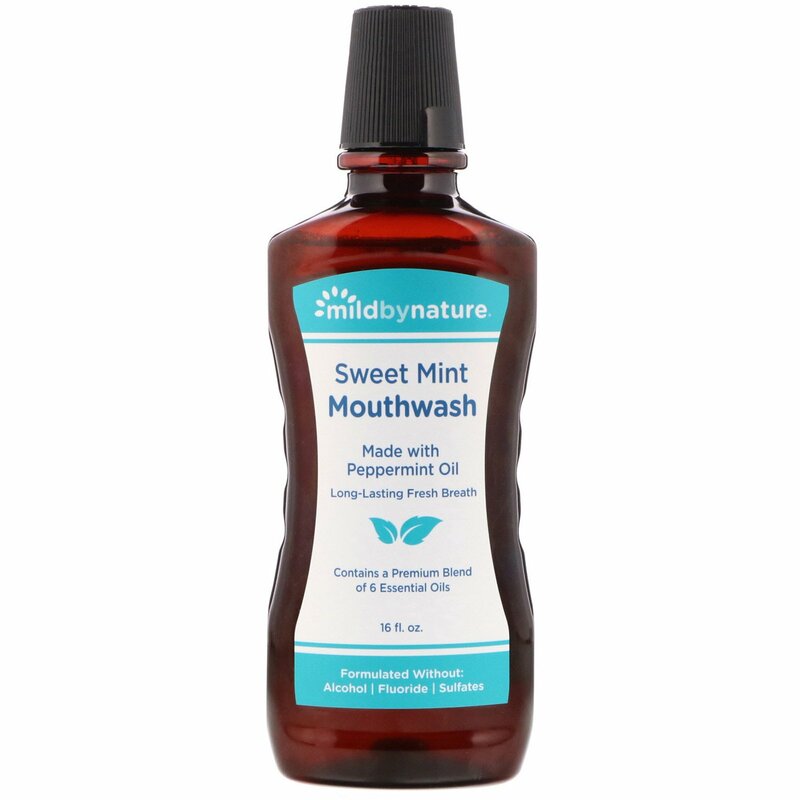 Mild By Nature Sweet Mint Mouthwash is a refreshing blend of six organic essential oils formulated for a clean mouth without the harshness of alcohol. Contains 6 premium essential oils: Peppermint, Oregano, Rosemary, Lavender, Cinnamon and Lemon. Also contains a synergistic blend of botanical extracts from Grapefruit Seed, Olive Leaf and Goldenseal. This advanced formula uses plant-derived ingredients that are non-drying for clean fresh breath. Each of the essential oils offers a unique benefit that you and your family can feel good about using. 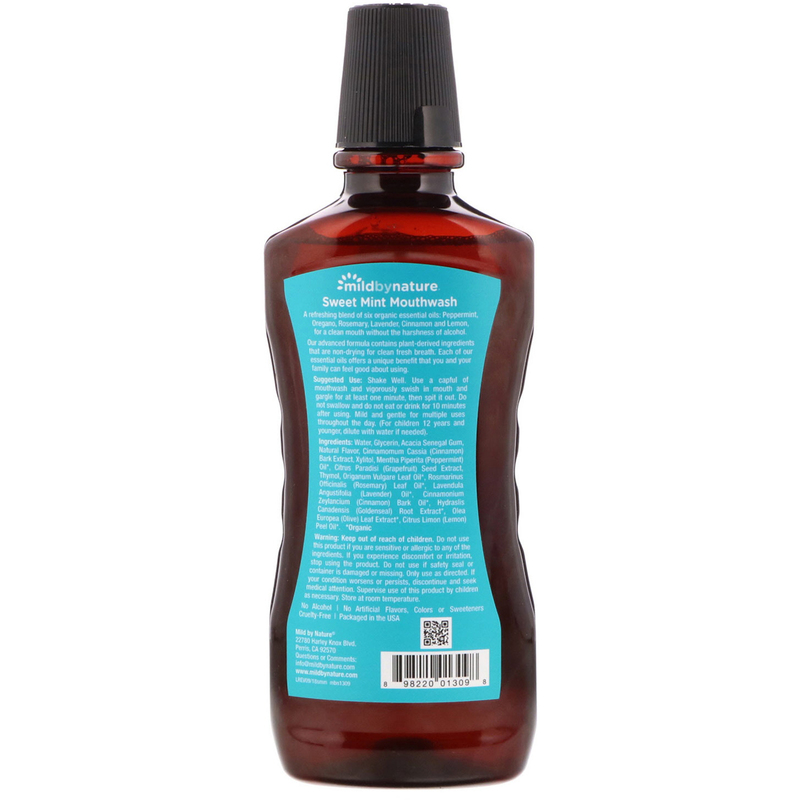 Featuring the power of Peppermint Oil, this mouthwash is available in two refreshing flavors, Sweet Mint and Fresh Mint. Shake Well. Use a capful of mouthwash and vigorously swish in mouth and gargle for at least one minute, then spit it out. Do not swallow and do not eat or drink for 10 minutes after using. Mild and gentle for multiple uses throughout the day. (For children 12 years and younger, dilute with water if needed). Warning: Keep out of reach of children. Do not use this product if you are sensitive or allergic to any of the ingredients. If you experience discomfort or irritation, stop using the product. Do not use if safety seal or container is damaged or missing. Only use as directed. If your condition worsens or persists, discontinue and seek medical attention. Supervise use of this product by children as necessary. Store at room temperature.